The Nate Sanders auction house has put up on eBay unsold auction items from the Ray Bradbury estate. 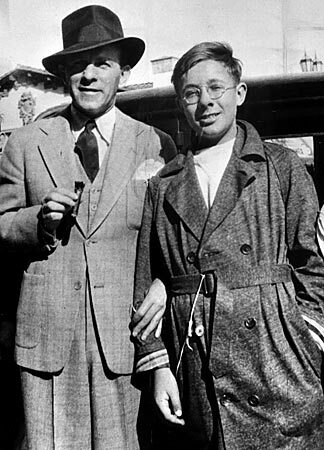 Offered for $500 is a picture of young Ray standing beside George Burns. Every time I see this photo I wonder “Why is Ray in a bathrobe?” Or with those double rows of buttons and the big belt, is it a trench coat he’s wearing? But what kind of trench coat has striped cuffs? Comes across like Henry Aldrich trying to be Humphrey Bogart. I think it’s a trench coat which is not only the wrong style for young Ray, but also the wrong size, so he’s rolled up the sleeves and exposed the plaid lining. He was as dorky as anyone at that age who loved to meet movie stars. A habit that seemed to persisted for years, according to what I’ve read.